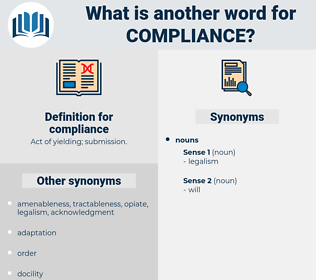 What is another word for compliance? do something of your own accord. noncompliance, obedience, cross-compliance, non-compliance, obeisance. specifications, norms, demands, processes, Veterans, sightings, observation, observations. assurances, accomplishments, obligations, accords, retailers, Goals, inspectors. data, coherence, concordance, consonance, responsiveness, correspondence, Non-performance, correlation, satisfaction, deference, harmonisation, acquiescence, observation, consensus, convergence, Adhering, furtherance, certification, Non-observance, faithfulness, accession, upholding, regularity, equivalence. conforming, aligning, spotting, sensing, seeing, shadowing, marking, Adhering. Contemplated, harmonized, Adhered, guaranteed, completed, fulfilled, violated, Upheld, Accorded, Indicated, allocated, maintained, permitted, interpreted, reported, conducted, specified, governed, recorded, protected, honoured, aligned, associated, authorized, executed, covered, discharged, guided, Issued, designated, described, needed, Shown, called, Watched, requested, seen, found, based, respected. corresponds, adheres, follows, observes, aligns, continues, fits, keeps, occurs. pursuance, observance, adherence, harmony, accomplishment, enforcement, harmonization, non-conformity. disobedience, dissent, refusal, fight, dissension, rebellion, disagreement, defiance, veto, difference, denial, nonconformity, resistance. impudence, outbreak, rebelling, disrespect, perversity, infraction, nonobservance, pigheadedness, trespass, rudeness, insurgency, breach, offense, antipathy, overlooking, unruliness, violation, enmity, sin, insolence, revolt, contravention, brush off, Insurgence, dissidence, Flouting, recusancy, naughtiness, self-will, insurrection, mutiny, hostility, mischievousness, wrong, noncooperation, transgression, infringement, disregard, misbehavior, animosity. My happiness requires it, and I have a right to expect your compliance. At the moment when this deputation reached Vienna the Government was formally announcing its compliance with the popular demand for a Constitution for the whole of the Empire.